This gadget is so much fun!!! I saw a recipe on a blog for zucchini "pasta" using the Joyce Chen Spiral Slicer. It almost magically slices zucchini, carrots and other vegetables (at least an inch thick and few inches long) into amazing curls. The veggies look so beautiful, and the slicing is a breeze if you follow the easy directions included with the slicer. 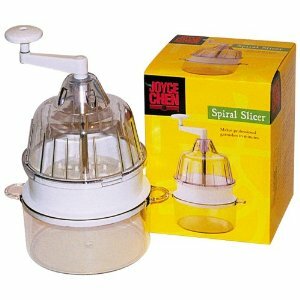 If you are looking for a special new kitchen toy and love your veg then the Joyce Chen Spiral Slicer is for you!